From the outside, you would never guess what’s hidden behind the plain brick walls of this old trading station. 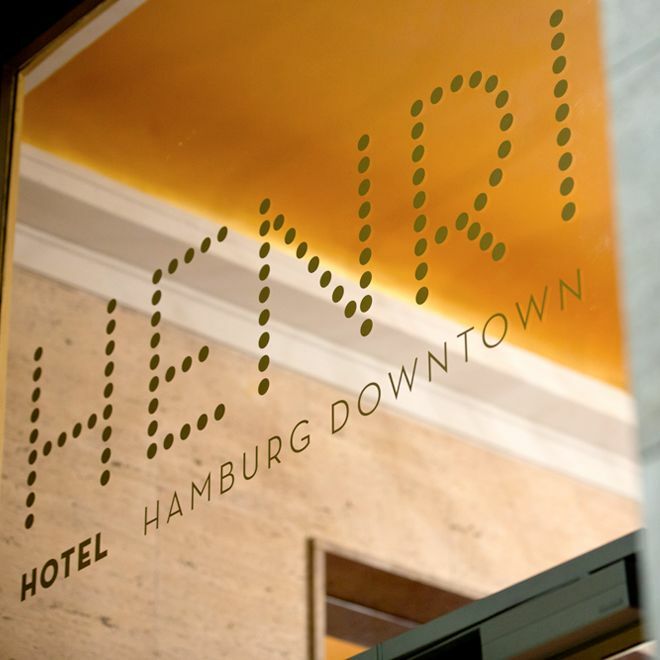 The Henri Hotel is one of Hamburg’s most pleasant and unconventional hotels. 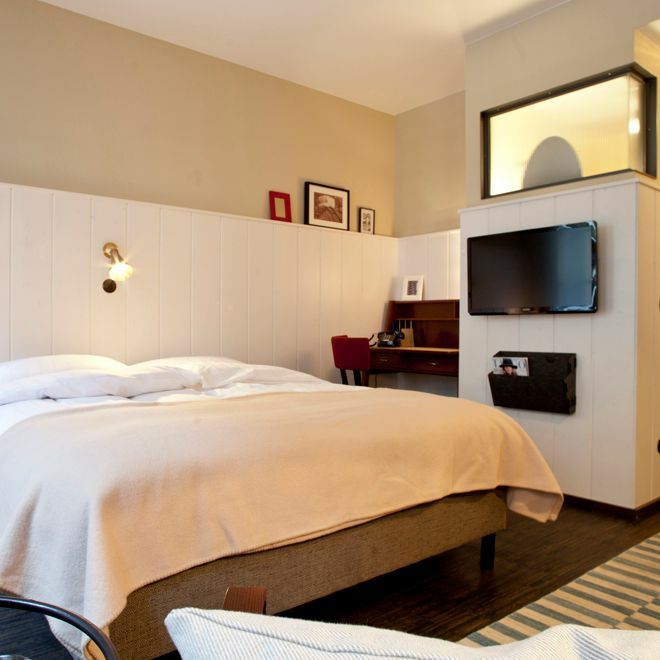 A business hotel with a 1950s feel, equipped with all modern conveniences. Travellers are supposed to feel somewhat at home, beginning with entering the lobby. The reception also houses the Henri Bar. Comfortable armchairs and couches are placed all around it, furniture that I would like to beam into my own living room right away. Books and accessories reminiscent of past times make for an even homier atmosphere. 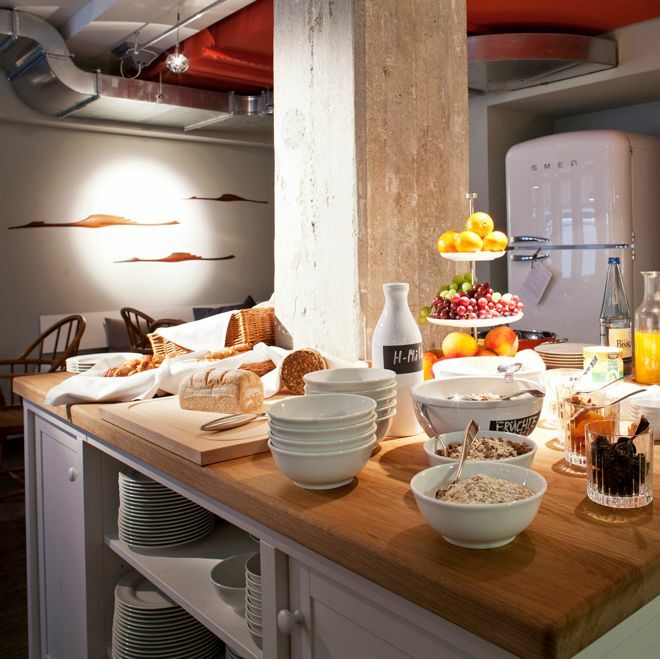 And to top it off harmoniously there’s the open kitchen that serves breakfast buffet and “the Abendbrød” supper every day. 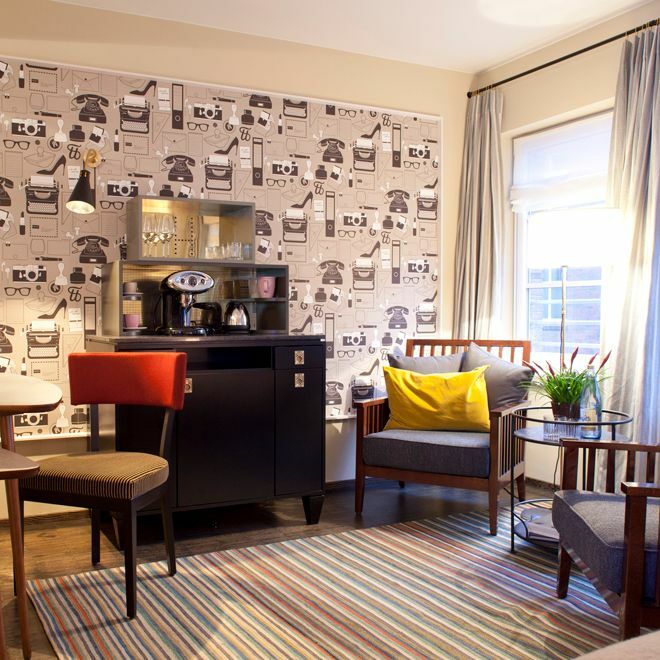 In addition, there’s a retro style refrigerator filled with soups, snacks and soft drinks for noshing, as well as an espresso machine available at all times. 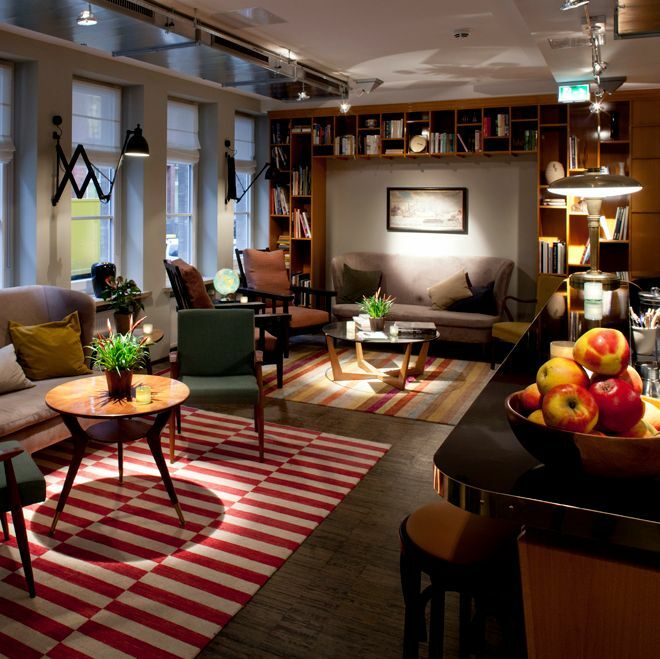 The Henri Hotel counts 65 rooms and suites, all equipped with custom-made interiors. 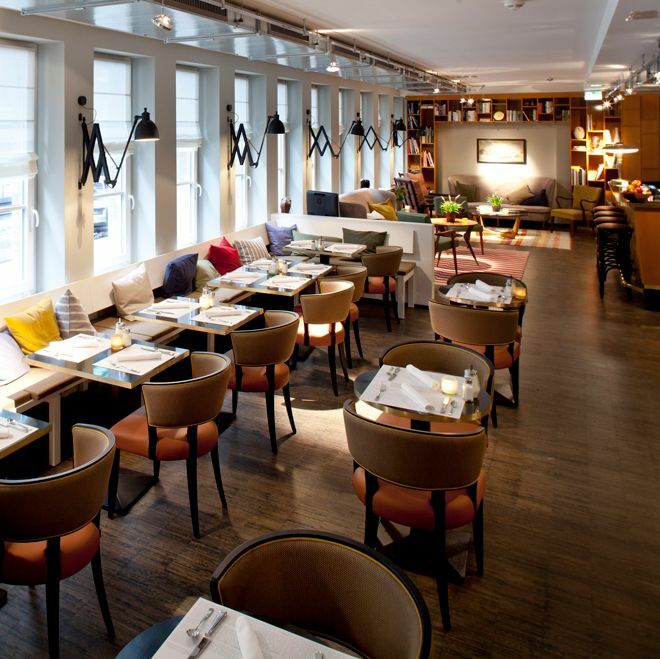 Characteristic triangular side tables, a vintage telephone and peppy wallpapers by Hamburg designer Katharina Haines, illustrated with office equipment typical of the 1950s era, put a smile on every guest’s face. It all has a ‘Mad Men’ feel to it, the only difference being the non-smoking rule, as suggested by little red table cards that read “Only Helmut Schmidt is allowed to smoke in this room”. On the 7th floor of the former office building you’ll find a little yet exquisite spa area, complete with a steam bath, a Finnish sauna and a breathtaking panoramic view over the city’s rooftops. The sweating continues in the basement: there’s a gym, designed and shaped like a typical St. Pauli boxing club. The hotel’s two-year-long conceptual phase is finally paying off: what you see here is a glorious symbiosis of retro design, humor and comfort.